The Carlton Football Club, nicknamed the Blues, is a professional Australian rules football club based in Melbourne, Victoria. Founded in 1864 in Carlton, an inner suburb of Melbourne, the club competes in the Australian Football League (formerly the Victorian Football League), and was one of the competition's eight founding member clubs in 1897. The club's headquarters and training facilities are located in Carlton at Princes Park, its traditional home ground, and it currently plays its home matches at either Docklands Stadium (currently known as Marvel Stadium) or the Melbourne Cricket Ground. Carlton has historically been one of the AFL's most successful clubs, having won sixteen senior VFL/AFL premierships, equal with Essendon as the most of any club; prior to this, it won six senior premierships, including two in the Victorian Football Association. The club has also fielded a team in the AFL Women's league since its establishment in 2017. Princes Park is an Australian rules football ground located at Princes Park in the inner Melbourne suburb of Carlton North. It is a historic venue, having been the home ground of the Carlton Football Club since 1897. Docklands Stadium, also known by naming rights sponsorship as Marvel Stadium, is a multi-purpose sports and entertainment stadium in the Docklands precinct of Melbourne, Victoria, Australia. Construction started in October 1997, under the working name "Victoria Stadium", and was completed in 2000 at a cost of A$460 million. The Melbourne Cricket Ground (MCG), also known simply as "The G", is an Australian sports stadium located in Yarra Park, Melbourne, Victoria. Home to the Melbourne Cricket Club, it is the 10th largest stadium in the world, the largest in Australia, the largest in the Southern Hemisphere, the largest cricket ground by capacity, and has the tallest light towers of any sporting venue. The MCG is within walking distance of the city centre and is served by Richmond and Jolimont stations, as well as the route 70 tram and the route 246 bus. It is part of the Melbourne Sports and Entertainment Precinct. Carlton has had a long and successful history, winning the most premierships of any club in the VFL era. Together with fierce rivals Collingwood, Richmond and Essendon, Carlton was considered historically to be one of the league's "Big Four" clubs, and enjoys a healthy rivalry with all three others. Since winning its last premiership in 1995, Carlton is experiencing its longest ever premiership drought, and has finished bottom of the ladder (i.e. 'won' the wooden spoon) the most of any club since the competition became known as the AFL. The Collingwood Football Club, nicknamed the Magpies or colloquially the Pies, is a professional Australian rules football club playing in the Australian Football League (AFL). Formed in 1892 in the then-working class Melbourne suburb of Collingwood, the club played in the Victorian Football Association (VFA) before joining seven other teams in 1896 to found the breakaway Victorian Football League. Originally based at Victoria Park, Collingwood now plays its home games at the Melbourne Cricket Ground with its training and administrative headquarters located at Olympic Park Oval and the Holden Centre. The Richmond Football Club, nicknamed the Tigers, is a professional Australian rules football club playing in the Australian Football League (AFL), the sport's premier competition. Between its inception in Richmond, Melbourne in 1885 and 1907, the club competed in the Victorian Football Association (VFA), winning two premierships. Richmond joined the Victorian Football League in 1908 and has since won eleven premierships, most recently in 2017. The Essendon Football Club, nicknamed the Bombers, is a professional Australian rules football club that plays in the Australian Football League (AFL), the sport's premier competition. Thought to have formed in 1872, the club played its first recorded game on 7 June 1873 against a Carlton Second 20, winning 1 goal to nil. The club played a senior club in the Victorian Football Association in 1878, one year after the VFA formed. It is historically associated with Essendon, a suburb in the north-west of Melbourne, Victoria. Since 2013, the club has been headquartered at The Hangar, Melbourne Airport, and plays its home games at either Docklands Stadium or the Melbourne Cricket Ground; throughout most of its history the club's home ground and headquarters was Windy Hill, Essendon, where it played from 1922 until 1991. While it stopped playing games at the ground thereafter, Windy Hill remained its training and administration base until the end of 2013. Dyson Heppell is the current team captain. 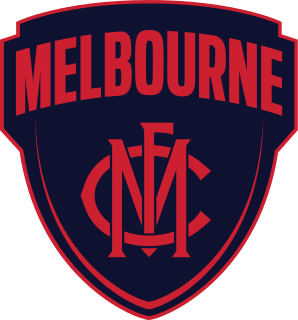 The Melbourne Football Club, nicknamed the Demons, is a professional Australian rules football club, playing in the Australian Football League (AFL). It is named after and based in the city of Melbourne, Victoria, and plays its home games at the Melbourne Cricket Ground (MCG). 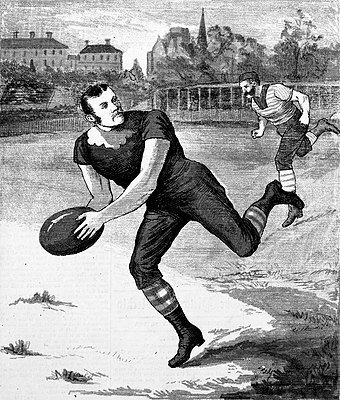 Carlton was one of the first clubs to have a player worthy of the superstar tag: champion player George Coulthard, who played for Carlton between 1876 and 1882, and was noted by The Australasian as 'The grandest player of the day'. He died of tuberculosis in 1883, aged 27. George Coulthard was an Australian cricketer and Australian rules footballer. The club won one more VFA premiership, in 1887, but after that, particularly during the 1890s, the club went from one of the strongest clubs in the Association to one of the weaker, both on-field and off-field. In spite of this, the club was invited to join the breakaway Victorian Football League competition in 1897. The club continued to struggle in early seasons of the new competition, and finished seventh out of eight teams in each of its first five seasons. Carlton's fortunes improved significantly in 1902. The Board elected the highly respected former Fitzroy footballer and Australian test cricketer Jack Worrall, then the secretary of the Carlton Cricket Club, to the same position at the football club. As secretary, Worrall slowly took over the managing of the players, in what is now recognised as the first official coaching role in the VFL. Under Worrall's guidance in the latter part of the 1902 season, Carlton's on-field performances improved,  and in 1903 he led Carlton to the finals for the first time. The 1914 Carlton team photographed at the old East Melbourne Cricket Ground. Carlton fell out of the finals in 1913, but returned in 1914 under coach Norm Clark, and with many inexperienced players, to win back-to-back premierships in 1914 and 1915 VFL seasons. Most football around the country was suspended during the height of World War I, but Carlton continued to compete in a VFL which featured, at its fewest, only four clubs. Altogether, between Jack Worrall's first Grand Final in 1904 and the peak of World War I in 1916, Carlton won five premierships and contested nine Grand Finals for one of the most successful times in the club's history. The only success which eluded the club was the Championship of Australia; Carlton contested the championship three times (1907, 1908 and 1914), with its South Australian opponents victorious on all three occasions. Through the 1920s and the Great Depression of the 1930s, Carlton maintained a strong on-field presence. The club was a frequent finalist, contesting fourteen finals series between the wars. However, premiership success did not follow, and the club contested only three Grand Finals for just one premiership during this period, and endured the second longest premiership drought (23 years) in the club's history. The drought was broken with the club's sixth VFL premiership in 1938, when former Subiaco and South Melbourne champion Brighton Diggins was recruited by the club to serve as captain-coach. On-field, Carlton's inter-war period was highlighted by two of its greatest goalkickers: in the 1920s, Horrie Clover (396 goals in 147 games), and in the 1930s, Harry "Soapy" Vallence (722 goals in 204 games), both of which were Carlton career records at the time. The period of success began when George Harris replaced Lew Holmes as president of the club, after the 1964 season. Harris then signed Melbourne legend Ron Barassi serve as coach from 1965. Barassi was a six-time premiership player and two-time premiership captain at Melbourne during its most successful era, and at the age of 28 was still one of the biggest names in the game. His shift to Carlton remains one of the biggest player transfers in the game's history. Also contributing to Carlton's success was the strength of the Bendigo Football League, to which Carlton gained recruitment access through the VFL's country zoning arrangements. Of the legendary players from the Barassi era, none was more important than John Nicholls, who captained all three premierships and took over as captain-coach upon Barassi's departure. Nicholls, a ruckman and forward, had played at Carlton since 1957, and he and Graham Farmer (who played with Geelong and in the WAFL during the same era) are regarded as the greatest ruckmen in the league's history. Midfielders Sergio Silvagni and Adrian Gallagher, half-forward Robert Walls, and ruckman Percy Jones were also prominent throughout the Barassi era, and in 1970, Alex Jesaulenko became the first (and to date, only) Carlton forward to kick 100 goals in a season. Carlton continued to play finals through the 1970s without premiership success, and went through several coaches in a short period of time: Nicholls (until 1975), Ian Thorogood (1976–77), Ian Stewart (for only three matches in 1978), and Alex Jesaulenko as playing coach after Stewart's departure. It was not until 1979 that Carlton again reached the Grand Final, defeating Collingwood by five points in a close match best remembered for the late goal kicked by Ken Sheldon, after Wayne Harmes tapped the ball into the goalsquare from the boundary line. Starring on-field during this period for Carlton was Bruce Doull, regarded as one of the best half-back flankers in the history of the league. Wayne Johnston was a prominent centreman/forward, and Carlton had great success recruiting high-profile Western Australian footballers to the club, including Mike Fitzpatrick, Ken Hunter and Peter Bosustow. In 1983, John Elliott took over the presidency from Ian Rice. On-field, the club endured three consecutive unsuccessful finals campaigns under Parkin before he was replaced by Robert Walls in 1986. Also in 1986, Carlton lured three of South Australia's top young players to the club: Stephen Kernahan, Craig Bradley and Peter Motley. The club reached the next two Grand Finals, losing in 1986 and winning in 1987, both times against Hawthorn. Kernahan went on to become the club's longest serving captain and leading career goalkicker (738 goals), and Bradley became the club games record holder (375 games); Motley's career was unfortunately cut short by a non-fatal car accident in 1987. Carlton had also recruited Stephen Silvagni (son of Sergio) in 1985, who is now recognised as one of the greatest fullbacks of all-time, and secured the league's star player Greg Williams in a trade in 1992. Carlton's overall position began to improve in 2007, when businessman Richard Pratt,  Steven Icke  and Collingwood's Greg Swann  came to the club as president, general manager of football operations, and CEO respectively; although Pratt's presidency lasted only sixteen months, after which he was replaced by Stephen Kernahan,  the new personnel stabilised the club's off-field position. Pagan was sacked as coach mid-season after a string of heavy defeats, and was replaced by former club captain Brett Ratten. Then, prior to the 2008 season, Carlton was able to secure a trade for West Coast's Chris Judd, one of the league's best midfielders, to join the club as captain. The time spent at the bottom of the ladder also allowed Carlton to secure three No. 1 draft picks – Marc Murphy, Bryce Gibbs and Matthew Kreuzer – who helped the club's on-field position. Brett Ratten led Carlton to the finals from 2009 until 2011, but was sacked with a year remaining on his contact after the club missed the finals in 2012,  and was replaced by former West Coast and Collingwood premiership coach Mick Malthouse. Under Malthouse, the club returned to the finals in 2013, but fell to thirteenth in 2014. Kernahan and Swann stepped aside in mid-2014, and were replaced by Mark LoGiudice as president and Steven Trigg as CEO. The club's on-field performances deteriorated drastically in the early part of 2015, and after eight weeks it was bottom of the ladder. The relationship between Malthouse and the club's new board began to deteriorate publicly; and on 26 May, after giving a radio interview critical of the board, Malthouse was sacked;  the club went on to finish last. Former Hawthorn assistant coach Brendon Bolton took over as coach from the 2016 season,  taking Carlton to 14th in his first year, but seeing the team decline again over the next two years to another wooden spoon in 2018 with a 2–20 record, the worst win-loss record in its VFL/AFL history. Carlton's club song is We Are the Navy Blues. The song is sung to the tune of the chorus of "Lily of Laguna" by Leslie Stuart. Four emergencies were also named: (1) Laurie Kerr, (2) Bob Chitty, (3) Horrie Clover and (4) Rod McGregor. The five players with an asterisk(*) are also members of the AFL Team of the Century – the largest number of any AFL club. The Carlton Football Club established its Hall of Fame in 1987, with nine inaugural inductees. As of May 2016, there have been 77 inductees. Carlton's current Senior Coach is Brendon Bolton, who takes over the team for the 2016 season. From the 2019 season, Sam Docherty and Patrick Cripps will serve as co-captains. VFL/AFL except where noted. Awarded the Coleman Medal since 1955. Twenty-two people have been inducted into the Australian Football Hall of Fame for their services to football for careers which were either partially or entirely served with the Carlton Football Club. Of those, three have Legend status in the Hall of Fame. Peter Bedford, Craig Bradley, Horrie Clover, George Coulthard, Bruce Doull, Ken Hands, Ern Henfry, Wayne Johnston, Stephen Kernahan, Anthony Koutoufides, Rod McGregor, Peter McKenna, Stephen Silvagni, Geoff Southby, Harry Vallence, Robert Walls, Greg Williams. Record attendance (finals match): 121,696, Grand Final, 26 September 1970 v Collingwood. Carlton operated its own reserves team from 1919 until 2002. From 1919 to 1991 the VFL/AFL operated a reserves competition, and from 1992 to 1999 a de facto AFL reserves competition was run by the Victorian State Football League. The Carlton Football Club fielded a reserves team in both of these competitions, allowing players who were not selected for the senior team to play for Carlton in the lower grade. During that time, the Carlton reserves team won eight premierships (1926, 1927, 1928, 1951, 1953, 1986, 1987, 1990). Following the demise of the AFL reserves competition, the Carlton reserves team competed in the new Victorian Football League for three seasons from 2000 until 2002. The reserves team was dissolved at the end of 2002, and Carlton entered a reserves affiliation with existing VFL club, the Northern Bullants. Under the affiliation, reserves players for Carlton play VFL football with the Northern Bullants. The partnership between the two clubs was strengthened in 2012, when the Northern Bullants were renamed the Northern Blues and they adopted Carlton's navy blue colours. The club now splits its home games between the VFL club's traditional home, the Preston City Oval; and Carlton's traditional home, Ikon Park. The Carlton Football Club operates two women's teams: one team in the AFL Women's competition, which it has fielded since the 2017 AFLW season; and one team in the VFL Women's competition, which will be fielded for the first time in the 2018 VFLW season. 2. ^ Harris had served two tenures as Carlton president: from 1965–1974, then from 1978–1979. 3. ^ The "suburban grounds" is a collective term generally understood to mean all venues in Melbourne, except for the Melbourne Cricket Ground, Docklands Stadium and Waverley Park. The 1908 Victorian Football League season was the 12th season of the elite Australian rules football competition. Rivalries in the Australian Football League exist between many teams, most of which typically draw large crowds and interest regardless of both teams' positions on the ladder. The AFL encourages the building of such rivalries, as a method of increasing publicity for the league, to the point of designating one round each year as Rivalry Round where many of these match-ups are held on the one weekend. Whilst some rivalries, such as between teams from adjacent areas, are still strong, the designation of an entire round of fixtures as Rivalry Round is often criticised due to some arbitrary match-ups, or ignoring stronger, more recent rivalries. The 1910 Victorian Football League season was the 14th season of the elite Australian rules football competition. The 1922 Victorian Football League season was the 26th season of the elite Australian rules football competition. The 1926 Victorian Football League season was the 30th season of the elite Australian rules football competition. The 1959 Victorian Football League season was the 63rd season of the elite Australian rules football competition. The 1965 Victorian Football League season was the 69th season of the elite Australian rules football competition. The Carlton Football Club has been involved in 29 VFL/AFL Grand Finals from 1897-2006, winning 16 premiership titles. 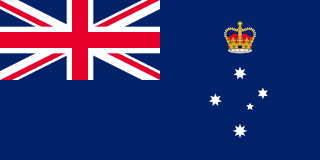 The 1941 Victorian Football League season was the 45th season of the elite Australian rules football competition. The 1981 Victorian Football League season was the 85th season of the elite Australian rules football competition. The 1972 Victorian Football League season was the 76th season of the elite Australian rules football competition. The 1973 Victorian Football League season was the 77th season of the elite Australian rules football competition. The 1976 Victorian Football League season was the 80th season of the elite Australian rules football competition. Wally Chalmers was an Australian rules footballer who played with Essendon in the Victorian Football League (VFL). The 1941 VFL Grand Final was an Australian rules football game contested between the Melbourne Football Club and Essendon Football Club, held at the Melbourne Cricket Ground in Melbourne on 27 September 1941. It was the 45th annual Grand Final of the Victorian Football League, staged to determine the premiers for the 1940 VFL season. The match, attended by 79,687 spectators, was won by Melbourne by a margin of 29 points, marking that club's fifth premiership victory. The Australian Football League is the top professional Australian rules football league in the world. The league consists of eighteen teams: nine based in the city of Melbourne, one from regional Victoria, and eight based in other Australian states. The reason for this unbalanced geographic distribution lies in the history of the league, which was based solely within Victoria from the time it was established in 1897, until the time the league expanded through the addition of clubs from interstate to the existing teams starting in the 1980s; until this expansion, the league was known as the Victorian Football League. The 1972 VFL season was the 76th season in the Victorian Football League to be contested by the Carlton Football Club. ↑ Ralph, Jon (12 May 2011). "Big V's power clubs on rise". Herald Sun. Melbourne. Retrieved 24 October 2011. 1 2 3 Devaney, John. "Carlton – Part One: 1864 to 1919". Fullpointsfooty. Retrieved 8 October 2011. ↑ Official Website of the Carlton Football Club History of the Blues Archived 1 September 2007 at the Wayback Machine Retrieved on 15 April 2007. 1 2 3 4 "Carlton Season Summary". AFL Tables. Retrieved 23 October 2011. 1 2 Devaney, John. "Carlton – Part Two: 1920 to 1964". Fullpointsfooty. Retrieved 24 October 2011. 1 2 3 4 5 6 7 Devaney, John. "Carlton – Part Three: 1965 to 2010". Fullpointsfooty. Retrieved 24 October 2011. ↑ Devaney, John. "Vic Team of the Century". Fullpointsfooty. Retrieved 23 October 2011. ↑ Niall, Jake (17 November 2005). "Carlton still paying "under-the-counter" money". The Age. Retrieved 30 September 2011. ↑ Ker, Peter (24 November 2002). "Carlton backs to wall". Archived from the original on 8 December 2002. ↑ Official Website of the Carlton Football Club Steven Icke joins Carlton "Mr Steven Icke has been appointed the general manager Football Operations with the Carlton Football Club." Retrieved on 15 April 2007. ↑ Official Website of the Carlton Football Club Greg Swann Joins Carlton "The Board of the Carlton Football Club today announced that it has appointed Mr Greg Swann as CEO." Retrieved on 15 April 2007. ↑ Lienert, Sam (28 June 2008). "'Sticks' says club will stick by Pratt". The Canberra Times. Retrieved 28 January 2012. ↑ Brett Ratten retires "Brett Ratten to coach his final game with Carlton on Sunday" Retrieved on 30 August 2012. ↑ Windley, Matt (11 September 2012). "Triple-premiership coach Mick Malthouse signs three-year deal with Carlton". Herald Sun. Retrieved 11 September 2012. ↑ Michael Warner; Mark Robinson; Eliza Sewell; Jon Anderson (26 May 2015). "Mick Malthouse sacked: Carlton terminates veteran coach's contract after explosive radio interview". Herald Sun. Melbourne. Retrieved 26 May 2015. ↑ Schmook, Nathan (25 August 2015). "Blues confirm Bolton as their new coach". AFL.com.au. Bigpond . Retrieved 25 August 2015. ↑ "Carlton Home Jumpers". Footyjumpers.com. Retrieved 24 October 2011. 1 2 3 "Other Club Nicknames". Blueseum. Retrieved 24 October 2011. ↑ "Carlton and Nike Announce Long-Term Partnership". 11 September 2008. Retrieved 28 February 2014. ↑ Bowen, Nick (26 May 2015). "All over: Carlton sacks Malthouse as coach" . Retrieved 26 May 2015. ↑ "They're out for the season". The Argus. Melbourne. 20 August 1956. p. 18. 1 2 "Carlton Football Club 152nd Annual Financial Report" (PDF). 2016. Retrieved 25 November 2017. ↑ Sam Edmund (18 September 2014). "Carlton will play six home games at the MCG in 2015 despite campaign for more". Herald Sun. Melbourne. Retrieved 31 October 2014. 1 2 3 Official Website of the Carlton Football Club The Carlton Honour Board Archived 22 July 2012 at the Wayback Machine Retrieved on 19 April 2007. ↑ Leading Goalkickers Retrieved on 25 June 2012. ↑ "Geoff Southby, David Rhys-Jones in Blues HOF". Herald Sun. 14 March 2013. Retrieved 14 March 2013. ↑ Ron Reed (29 April 2016). "Sergio Silvagni follows son Stephen Silvagni as a Carlton legend". Herald Sun. Melbourne. Retrieved 30 April 2016. ↑ Official Website of the AFL List of Brownlow Medal winners Retrieved on 14 April 2007. ↑ Previous Winners – The Coleman Medal Archived 24 September 2012 at the Wayback Machine Retrieved on 25 June 2012. ↑ Official Website of the AFL Norm Smith Medalists Retrieved on 14 April 2007. ↑ Peter Ryan (4 February 2016). "Blues allocated region for academy" . Retrieved 6 February 2016. ↑ Brunette Lenkic & Rob Hess (2016). Play On! – The Hidden History of Women's Australian Rules Football. Richmond, Victoria: Echo Publishing. p. 77. ISBN 9781760063160. ↑ Brunette Lenkic & Rob Hess (2016). Play On! – The Hidden History of Women's Australian Rules Football. Richmond, Victoria: Echo Publishing. p. 111. ISBN 9781760063160. ↑ Bruce Matthews (15 June 2016). "Eight teams named for inaugural women's league". Australian Football League. Retrieved 15 June 2016. 1 2 "Women's coach unveiled". Carlton FC. Bigpond. 30 June 2016. Retrieved 14 October 2016. 1 2 "Global brands commit to Carlton's women's team bid". Carlton FC. Bigpond. 8 April 2016. Retrieved 14 October 2016. ↑ "Sixteen of the best: women's marquees named". AFL.com.au. Bigpond. 27 July 2016. Retrieved 14 October 2016. ↑ "Draft". AFL.com.au. Bigpond. Retrieved 14 October 2016. ↑ Pike, Chris (17 March 2018). "AFLW match report: Dockers dodge spoon". AAP. Australian Football League. Retrieved 17 March 2018. ↑ "Davey crowned AFLW B&F". Carlton Media. Telstra Media. 27 April 2017. Retrieved 27 April 2017. ↑ Landsberger, Sam (10 April 2018). "Katie Loynes and Breann Moody crowed joint Carlton AFLW best-and-fairest winners". Herald Sun. News Corp Australia. Retrieved 15 April 2018. ↑ "Blues secure VFLW licence". Carlton Football Club. 11 October 2017. Retrieved 11 October 2017. ↑ "Season Records". AFL Tables. Retrieved 8 October 2011. Wikimedia Commons has media related to Carlton Football Club .